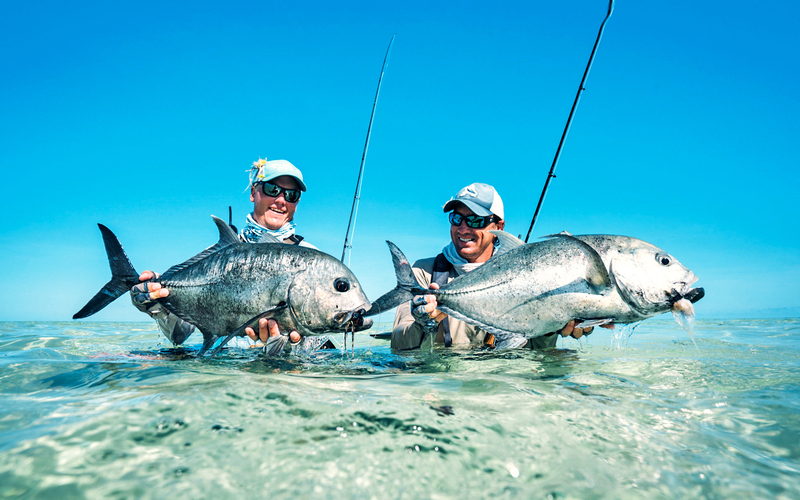 Cosmoledo’s large white sand flats, lagoon edges and channels are, without question, ruled by the notorious giant trevally, so much so that it is often referred to as the GT capital of the world. Cosmoledo comprises of a larger white sand lagoon surrounded by 18 islands, numerous flats and two main channels. It is one of the most remote inhabited islands in the Seychelles, and can accommodate up to 10 fly fishermen per trip. It’s an untouched ecosystem full of hungry, tackle-busting giant trevally. 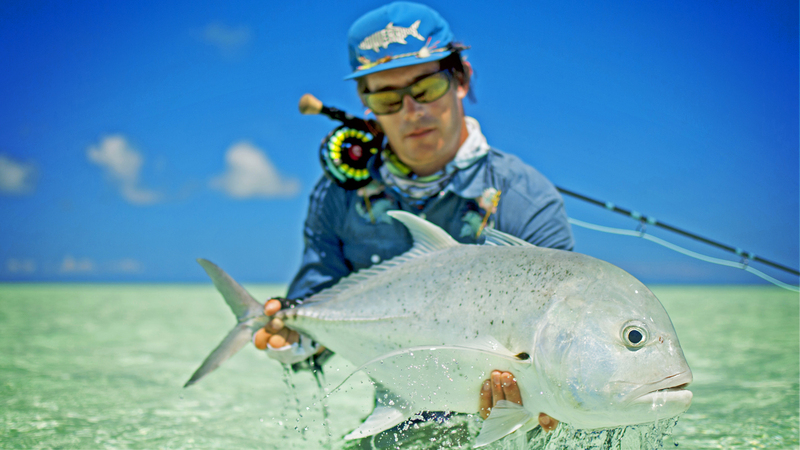 Cosmoledo’s large white sand flats, lagoon edges and channels are, without question, ruled by the notorious giant trevally, so much so that it is often referred to as the GT capital of the world. These fish are, however, not the only species that can be found here in impressive numbers. 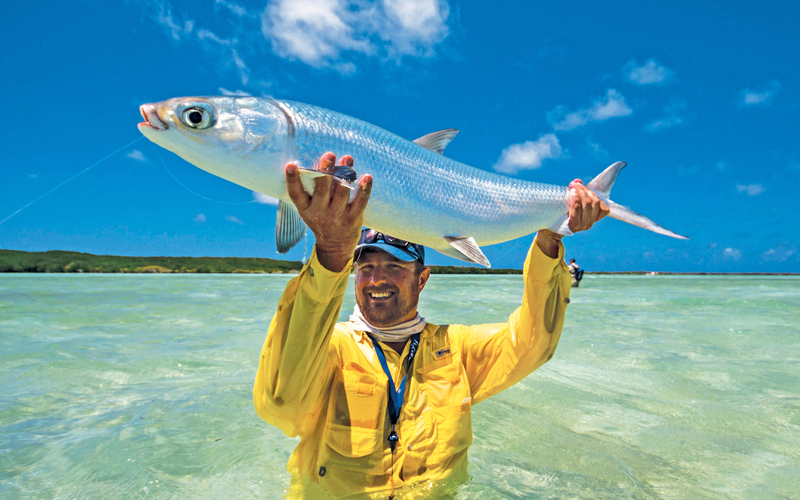 Large bonefish, bluefin trevally, bohar snapper, barracuda, milkfish, the finicky Indo-Pacific permit and a host of triggerfish species all call Cosmoledo home. The charter flight will depart Mahé and after 3 hours will arrive to Astove island, where the team will be transported on a vessel to Cosmoledo Atoll. During the trip, anglers will be briefed about the fishing and the area as well. Upon arrival anglers will be accommodated in their rooms and get their tackle ready. Breakfast is served at 7.00 hs and anglers are ready to leave the lodge at 08.00 hs. Anglers can choose between a packed lunch or return to the lodge for lunch. Teams will head back to the lodge around 17.00 hs. Cosmoledo has a single Eco-lodge situated on Wizzard Island; where nature meets creative, eco-friendly hospitality. The lodge consists of eight double/twin en-suite rooms with a central communal dining and entertainment area. The chef prepares a mix of Creole and international dishes and incorporates fresh fish on a daily basis, with fruit and vegetables which are farmed in the Alphonse garden. The lodge is fully equipped with snorkelling and dive gear as well as stand up paddle boards and kayaks that are available for all guests to use. Rates include: Domestic flight to and from Astove, Scheduled transfers to and from Cosmoledo, 7 nights accommodation, all meals and soft drinks while fishing, wine with dinner, 6 full fishing days. Rates do not include: International air tickets, Mahé accommodation and transfers, health insurance, Conservation Donation (USD 175), fishing equipment and flies, additional excursions and beverages, gratuities.